All cylinders include medical block valve and are shipped empty. Other sizes and styles are available. Call 1-800-526-1196 for additional information. Aluminum cylinders are available in D, Jumbo D, or E size. 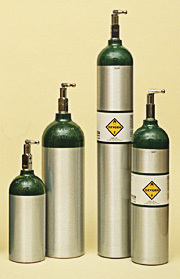 D size weighs holds 420 liters of oxygen and weighs 8 lbs. E size weighs 11 lbs. and holds 680 liters. Jumbo D holds weighs 11.5 lbs. and holds 637 liters of oxygen. C size holds 240 liters. Aluminum D or E cylinders are available with or without Off-On Toggle Handle, eliminating the need for a cylinder handwheel. C size and Jumbo D include Off-On Toggle.